The Iroquois Stakes is 1 1/16th on the dirt for those unpredictable two-year-olds. The race got its tag from a horse named Iroquois, which was the first American horse to win England's Epsom Derby. It's also a race with major consequences. It begins the Road to the 2019 Kentucky Derby, and the Iroquois is a "Win and You're In" race for the Sentient Jet Breeders' Cup Juvenile. Beyond your bets, there will be a lot on the line when the gates pop open at roughly 5:26 pm Louisville, Kentucky time. Let's see which horse racing toddler we think is going to cash those tickets. "TIGHT TEN finished second in the Grade 2 Saratoga Special, but bobbled at the break. If he gets off to a better start as recent works suggest, will be tough to beat. TOBACCO ROAD has won two in a row, showing race-over-race improvement. MANNY WAH has run second, first, third in his first three races. He should be in the mix all the way around the track. 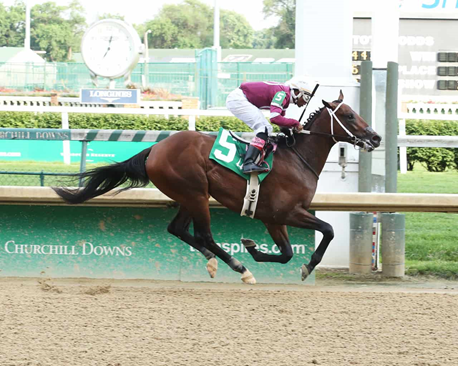 HOG CREEK HUSTLE gained a lot of ground in the last furlong of a 5-furlong race, stretching out should work to his benefit." On a side note, we think morning-line odds of 2-1 are spot on for TIGHT TEN. However, we suspect he'll be an underlay by post time. So, you might get better value pairing him up with our other selections in an exacta or double. The backend of the double is the Garde 2, Pocahontas Stakes. Like the Iroquois, the Pocahontas is another "Win and You're In" race for the Breeders' Cup Juvenile Fillies. It's also the first points race for the 2019 Kentucky Oaks. Again, like the boys, these two-year-old fillies will be running 1 1/16th miles on the Churchill dirt track. In the spring meet (April 28 - June 30), the distance/surface favored early speed types. Horses that ran at/near the front won at a 60% clip, but only 18% went wire-to-wire. On average, the winner ran second or third at the 1/4 mile marker. Up to eight horses fit that profile in this group. It's possible that a pack of these ladies scramble to the front of the line, including our top selection, SPLASHY KISSES who "pounded the competition at Del Mar, a high-quality track that attracts higher quality horses. She'll be hard to pass if she runs the same race." KISSES will have to beat the 5/2 morning favorite, SERENGETI EMPRESS. She "ran the highest speed figure in the field last out, but at Ellis Park. Let's see if it translates to Churchill," as noted in our pro-subscribers bonus commentary. We finish up our Saturday stakes previews with the Woodbine Mile. It's the day's third "Win and You're In" race for the Breeders' Cup Challenge. Not surprisingly, the race is one-mile on the Woodbine, Canadian grass. This race, and at Woodbine in general, a mile on the turf favors closing style horses. Not withstanding the two international entrants, only two in the field of nine are natural early speed types: LA SARDANE (PP: 2 ML 15-1) and OSCAR PERFORMANCE (PP: 7 ML 7/2). OSCAR was the favorite at the Arlington Million in his last but pulled up. While his trainer, Brian Lynch, wins at 24% with beaten favorites, we have our concerns. "OSCAR PERFORMANCE could win this race, probably will if he runs his best. The problem is he tends to run two bad ones in a row, last out was awful," is the way we put it in our bonus commentary. As for the rest of the field, "MR HAVERCAMP has been running strong races since coming off a six-month hiatus on June 16th. Overall, he's won four of six on the grass. DELTA PRINCE ran his best speed rating ever last out, hitting triple digits for the first time. He could be even better third after a layoff. VANISH has been closing hard in his first two races after a break. His last is on par with the rest, why not take 20-1? LORD GLITTERS trainer, David O'Mear has two wins in two tries with first time Lasix horse. We'll keep playing the angle until it doesn't work." There you have it, three Breeders' Cup "Win and You're In" races along with 10 other $100,000 and up stakes races for your afternoon betting delight. GET OUR FULL CARD CHURCHILL AND WOODBINE PICKS PLUS ALL OTHER TRACKS!